As a rough approximation according to average values for the Bonwill triangle and the Balkwill angle, thereby producing an average-value occlusal field of minimal functional value. Mounting in fixed-value articulators is done by visual judgment or with a calibration key. Cranium- or joint-oriented mounting with a tracing arch (facebow or transfer arch) in semi-adjustable or fully adjustable devices, where models are mounted in alignment with defined reference planes and an individual occlusal field can be reconstructed. For cranium-oriented mounting of models, a facebow is used that carries a bite fork for the maxillary dentition. The facebow is oriented toward the hinge axis and one other reference point. As a result, a spatial relationship can be created between the maxillary teeth, the hinge axis, and a reference plane. The reference planes used are the Camper plane, the hinge-axis orbital plane (auriculo-infraorbital plane), and the midface horizontal plane. The fact that the alignment of these reference planes is parallel to the upper arm of the articulator means that the orientation of the occlusal plane in the articulator will vary. All the reference planes are oriented toward the hinge axis and only differ in their anterior reference point.The accuracy of this method relies on precise localization of the hinge-axis points and the reference point for the reference plane. The anatomical hinge axis can be determined by individual axis localization. As a rule, however, an arbitrary (average-value) hinge axis is adopted. Individual axis localization is done with an axis locator, eg, the Almore facebow, which is fixed onto the mandible to locate the hinge axis. On a transverse fixing rod, the U-shaped arch carries a bite fork in the form of an impression tray for fitting onto the mandibular teeth (Fig 8-34).The side tracing arms can be lengthened or shortened and rotated around the transverse fixing rod.The tracing needles for fixing the hinge-axis point can in turn be adjusted on the side tracing arms. Axis localization is based on the principle of amplitude: The tracing needles trace varying amplitudes depending on the distance from the rotation center. To this end, tracing flags are positioned over the suspected axis points (eg, by placing graph paper that sticks to the skin). The mandible then performs hinge movements, and the tracing needles trace circular movements. The needle is pushed nearer and nearer to the rotation center until it rotates over the center during hinge movements. The rotation centers are marked on the skin, and the individual hinge axis is thus located. In a normal clinical case, an arbitrary (average-value) quick tracing arch will be used. The hinge axis is not localized individually but as an average value marked on the tragus-canthus plane as lying 12 mm before the tragus, or it is located in relation to the opening of the external auditory canal (porus acusticus externus). The arbitrary facebow comprises a width-adjustable basic device with earpieces mounted onto its side tracing arms. The transverse fixing rod carries the joint support adjustable in three directions, with which the bite fork can be fitted onto the maxillary teeth. In addition, the adjustable glabella support (nasion adapter) is attached to the transverse fixing rod for alignment with the reference point of the reference plane (Fig 8-35). The earpieces of the arbitrary facebow are inserted into the external auditory canal, and the glabella support is placed on the bridge of the nose so that the facebow lies parallel to the chosen reference plane. The bite fork is fixed to the maxillary dentition with silicone impression material and connected to the facebow via the joint support in its individual position (Fig 8-36). 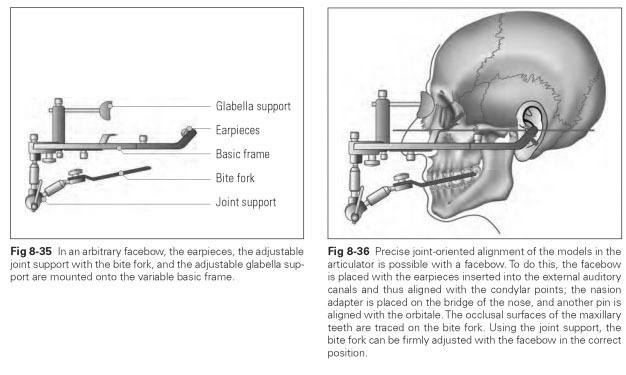 For cranium-oriented mounting of the maxillary model, the adjusted facebow is aligned with the reference points in the articulator and the maxillary model is set in plaster.